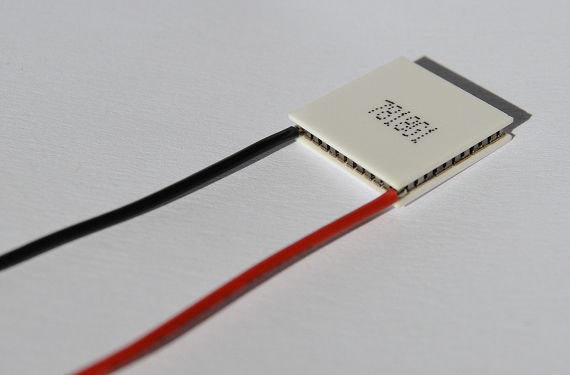 Multi-purpose module TM 71-1.0-3.0 is a popular 20 x 20mm cooler intended for use with 5 to 8.6 volt (DC) power sources. Its compact size, good cooling capacity and relatively low heat ejection, make the module particularly popular where thermal loads are moderate and/or heatsinking space is limited. Can be used with a very wide variety of economical extruded heat-sinks without the hot-side temperature becoming unreasonably high. It’s also frequently used in strings. For example, two connected in series can be operated from a 12V source (or 15V). Four in series are operated with a 24V source, etc. A combination of parallel strings of modules in series allows coverage of a large surface area. 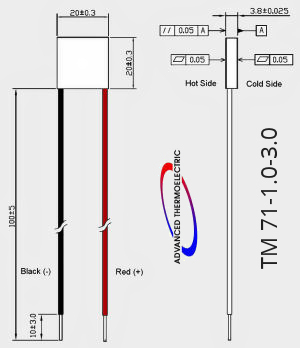 TM 71-1.0-3.0 may be used for cooling, heating and thermal stabilization and is employed in a wide range of applications including electro-optic/photonic, fiber optic, aerospace/military, telecommunications. A version for thermal cycling is available. Available with metalized and tinned surfaces. Epoxy edge sealing = "E"
RTV edge sealing = "RTV"
Lapping to ± 0.01mm = "L"
Please contact us for a quotation. sales@electracool.com or (603) 888-2467. 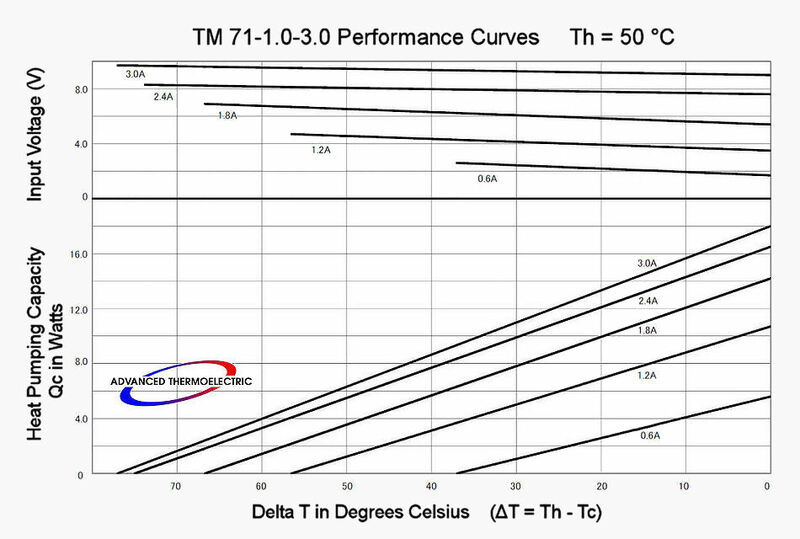 Thermoelectric module performance curves are graphical representations showing the relationships between power applied and net cooling for a specific TE module. 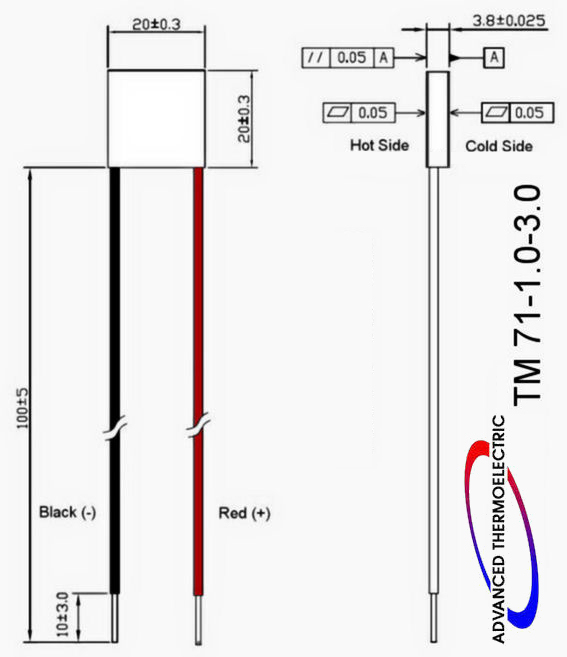 Performance curves are valuable tools for quickly determining if a TE module is a suitable COOLER for an application; learning what power is required for an appropriate module to reach the desired temperature and heat pumping capacity; and to provide the basic information necessary for proper assembly design. Curves with Th = 27 °C indicate what to expect operating in ambient temperatures around 20 °C (70 °F) with an operational "hot-side" temperature or Th about 7 °C above ambient. 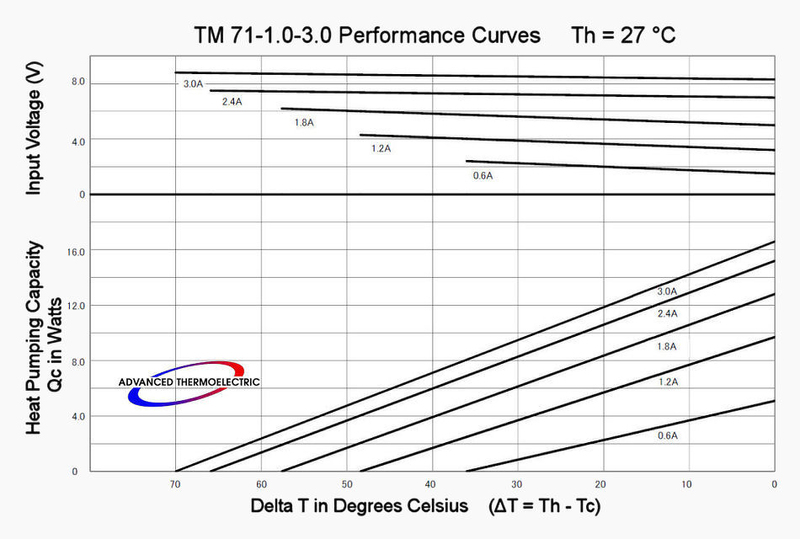 Curves with Th = 50 °C are for outdoor, box-in-box, and other applications with ambient temperatures in the 40-50 °C range.